Should Flame22 be expelled from the Union? 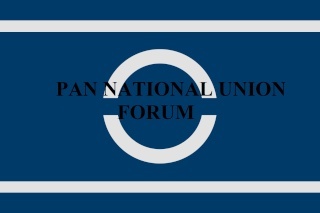 Recently I have been informed by Flame22 that he was going to be expelled from the Pan National Union. He has told me and I have been confirmed of this that he was given that because the Senate recently passed a new bills, prohibiting tech raids. But I have come to defend him. For the actions that he has committed was not known by him. I ask you this Senate and the people. He never had an account on our forums, so how will he know of that knew bill passed? Now of course you're probably thinking "Just make an account then" But currently that is not the problem. He was accused for not listening to a bill that he never knew was passed. Instead of informing the public of the new senate bill to nations who have not registered on the forums, we have made It so they could not see, but people who registered can. It is a drastic thing you need to do, to register on the alliance forum. But honestly over 3/5's of our alliance has not registered on the forums. Flame22 can not be punished for something he has never heard of, it is simply intolerable and strips all of the means of a good government and bases. We need to at least give him a warning or second chance. He does not deserve that punishment. And also Flame22 has been very loyal to this alliance. He was one of the first responders when our President gave the command to attack KYA, and he has proved to be very helpful and active to us. Having him expelled would not only make the alliance weaker, but also decrease the amount of people who young nations could look to for a helping hand. We are an alliance of Democracy, if it resorts to this, than why not let the senate vote n his expulsion, or the people vote (except senate will have more authority so I recommend them.) Please brothers and sisters... do not let him face the punishment. But I still believed tech raiding should be banned, I just want it so our people could know it. We will put this to a vote, the Senate will have the final say. It is the responsibility of everyone in the alliance to have an account on the PNU forums so that they can have information on new laws and regulations. Everyone in the alliance is expected to know of these laws. Those who do not make an account, well, they're going to have trouble if we change something. Sultan Hassan, if you do not want this to happen again to your members then I strongly suggest you urge them to make accounts or at least warn them of these new rules. I understand, it is hard and we do members. It is just that such wars HURT the Union. If flame22 is to stay, he will have to pay Aurora Borealis. It is harsh, but we can only be certain he learnt his lesson after that. But we must remember that it is not my choice but the Senate's. If it decides that we can no longer support flame22, then we will be forced to let him go. Except I just got a pm telling from flame22 telling me that one of the members attacked in their alliance said that it is the protectors duty to pay the money, not ours. Looks like flame22 has been saved. Please tell him that this is his final warning. Thread Closed. Success for flame22.